Depending on where you are, the flowers are starting to bloom, you are getting your garden started, planning trips, packing up for spring break, or in some cases, stocking up on bread and milk because a blizzard is on the way! Whatever it is you're preparing for, chances are, you have warmer weather on the way (I promise, even for some of us, it will arrive soon!) and now is probably a good time to start dreaming of your vacations! Whether you plan to fly or drive cross country, there is always a need for travel size products! There are some pretty fab products out there that are even better in a smaller size so you can take them with you wherever you go. I like to stay stocked up on tiny packs of mints, floss, cleaning wipes, bathroom wipes, tissues, hand sanitizer, and now, one of our most used and most loved products comes in travel size too! 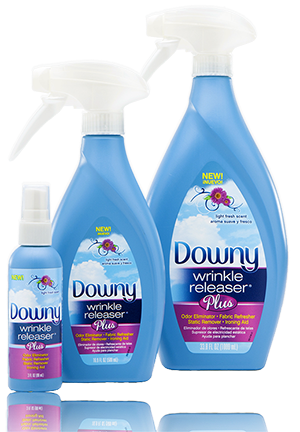 Downy Wrinkle Releaser Plus now comes in a 3oz bottle which meets airline standards and fits practically anywhere! Even though I have never been on a plane and I still am not so sure I ever will be, (yes, it is one of my biggest fears! ), these are the perfect size for my truck, purse, and my husband has a bottle with him in his tractor trailer. (I think he uses this magical stuff more than I do!) He is usually on the road for a few days at a time and has to pack his clothing in a backpack and try to ram it in a couple of small spaces inside the sleeper, so, he relies on Downy Wrinkle Releaser Plus quite a bit. I have a bottle in our "back to school/errand station" (my kids named this.) This is where we have travel size things, lip balms, other little goodies, some school supplies, everything we can think of that we need in a pinch, is right here on the back of our laundry room door. It is a shoe organizer, yes indeed. Most everything fits perfectly and it is all out of view! I know it is a bit overstuffed at the moment but we just refilled it. Just in case the kids have to quick spray their jeans, refresh their sweatshirts, or I need a refill, we just grab and go. Where else does a 3 oz bottle of Downy Wrinkle Releaser Plus fit? (Oh, quick! Click that link to find some special offers and coupons!!) These fit great in overnight bags, gym bags, sewing kits, diaper bags, any place you can stash a bottle is perfect! Not only is Downy Wrinkle Releaser for um, wrinkle releasing, but it has a lot of other qualities too! You can use it as a fabric refresher, an odor eliminator, static remover, ironing aid, wrinkle spray, and wrinkle remover. Of course it smells as fresh and clean and just like Downy fabric softener! My little ones love to use it on their stuffed animals and pillows too. So, I guess I should probably share some travel hacks awhile. Otherwise, I'll have to change the title of this post! To scared to fly on a plane? Or are you vacationing within driving distance? Pack some snacks! Yes of course you can make a list of what snacks beforehand. We carry one of those small coolers with a handle and take some drinks and pack "homemade happy meals" which are much healthier then the fast food kinds. (and less expensive.) Stock up on some small toys, stickers, your kid's favorite blind bags, pack a sandwich or wrap, a drink, fruit snacks, granola bar, string cheese, and always fold a napkin and write a special note or picture for a special surprise. Travel games are a fun option for little ones who constantly ask how many more miles (or blocks) are left. We like to play travel bingo when we are on long trips. Fill your console with mom (or dad) things. Like, tissues, cleaning wipes, napkins, lip balm, lotion, change for tolls, snacks you don't want to share, phone and tablet charges, hand sanitizer and of course, Downy Wrinkle Releaser Plus in their new travel size bottle!